Ah, bingo. He does think I’m a groupie. I nudge him in the ribs and nod. The guitar player nails me with a narrowed look and crosses his arms over his plain t-shirt. “Why don’t you go first, Riley?” His tone is smooth but I catch the undertone of sarcasm in his voice. He doesn’t think I can play. Because I’m a girl? Jean Haus lives in Michigan with her wonderful husband and son who, other than cooking, have taken over homemaking duties since she started writing more. When Jean isn’t writing, she’s usually reading. Anything from young adult to historical fiction as long as there is a bit a romance, she’ll load it on her Kindle. She loves to cook, and someday she will create the world’s best potsticker. I'm a sucker for a contemporary romance featuring music or musicians. There's something about the power of music and a couple falling in love which calls to me. In the Band drummed a steady beat straight into my heart and I really liked Riley and Romeo. Riley can be tough, has a passion for drumming, and loves her family. Her dad left her mom and Riley has stepped up to help out watching over and caring for her eight year old sister, Jamie. This college freshman gives up her scholarship and chance in the marching band to stay home and go local. When her close friend Marcus tells her to audition for a rock band, she scoffs at him until he takes her to see the band. She likes their energy, their cover song selections and original material, and the dark haired guitarist is smoking. After a tense audition, Riley finds herself the female drummer of a male rock band. But with her mom escalating into depression as the divorce is finalized, Riley finds herself falling--in love with the hot Romeo and falling farther away from her own self as the pressures of family life take over. Talk about powerful situations! Turbulent family problems, acting as guardian for a sibling, accepting her father's soon to be new wife, college, playing in a popular band and falling for a dynamic guy all kept me glued to Jean Haus' In the Band. Riley's strong voice grabbed me from the get go. I loved her passion for drumming, her unselfish compassion for others (ex. her consideration for ex-boyfriend Aaron), she is such a likable character. There were times I wanted to hit her with her own drumsticks and repeat what her friend Chloe told her when she told her to stop being a martyr. Alongside all the parental drama and music is a love story. Guitarist Romeo is a take charge type of guy and his rough demeanor during Riley's audition only strengthens her conviction to blow the band away with her talent and ability. She does and unknowingly takes Romeo's heart as well. In other stories, lust comes before love and here it was nice to see two wounded souls with a shared love of music become friends as they fall for each other. Heartbreak ensues and the author handled the subject of depression with grace. I thought Romeo was trying out for Mr. Perfect until his revealing scene with Riley and his character clicked for me. I liked him. I did find Marcus and Chloe's storyline a bit unconvincing at times, though I liked them as well. 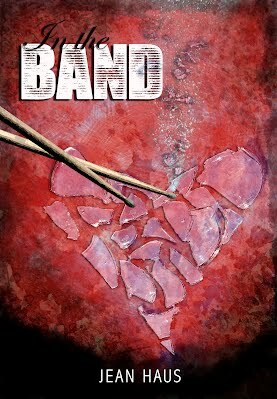 Music, swoon-inducing guys, and an admirable young woman make In the Band the unforgettable and engrossing novel it is. Recommended. Cover comment: Unforgettable story, forgettable cover. Don't like it at all.